Shorebirds are a diverse avian group. These groups form the 49 species of shorebirds that are common in North America. They generally have small bodies, long, thin legs and no webbing on their feet. One of the interesting facts about shorebirds is their amazing variety of bill shapes and sizes. Differences in bill length and shape allow the many species of shorebirds to forage for food on dry soil or in shallow water. 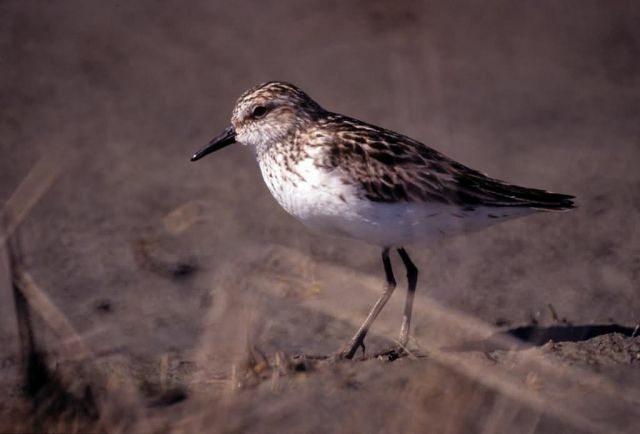 Shorebirds range in size from a few ounces to a pound or more and come in a variety of colors. Shorebirds migrate over incredible distances. The migratory paths used by shorebirds are influenced by geography and wind. Shorebirds are thought to have an internal compass for directional orientation which may be influenced by the sun, moon, position of stars, polarized light, magnetism, wind, photoperiod, or even olfactory cues (Kerlinger, 1995). Shorebirds are closely associated with wetland areas but do not swim. They are found in intertidal mudflats, salt marshes, and estuaries. Though many species can be found on ocean shores, a great many also use interior fresh water wetland areas of North America along their migratory routes and in breeding areas.